All medicine, including vitamins, are up and away and out of sight. Remember to keep visitors’ purses, bags and coats out of reach, as they may contain medicine. Child-resistant packaging is NOT childproof. 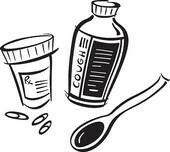 Put all medicine up and away immediately after use. In case of an emergency keep the Poison Center Help Line number 1-800-222-1222 in your phone and posted in your house.